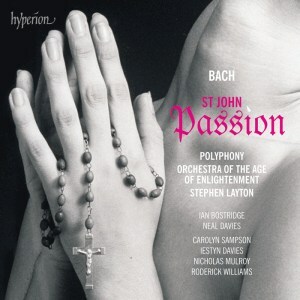 A few years ago Hyperion issued a recording of the other seasonal staple of the Polyphony repertoire, Messiah (review). That recording was widely-acclaimed; will this new Bach recording be equally good? Among the many advantages with which it starts is the extremely strong line-up of soloists, including Ian Bostridge as the Evangelist. I’ve heard Bostridge in the Evangelist’s role in Philippe Herreweghe’s 1998 recording of the St. Matthew Passion (Harmonia Mundi HMC 951676.78) and having been impressed by that I was keen to hear him in this role. In my view he’s a magnificent Evangelist though one aspect of his approach may not be to all tastes. He is highly expressive at all times and there are several occasions where some may feel he overdoes the expressiveness, drawing out the line of recitative slowly and expansively. One such example - there are several - is the passage of recitative describing the Crucifixion itself: ‘Allda kreuzigten sie ihn’ (CD 2, track 5). For myself, I find this approach very convincing and of a piece with Bostridge’s complete involvement with the drama but, as I say, some may prefer a less overtly expressive style. The gains from this approach are immense, witness the very moving description of the crucified Christ putting his mother into the care of his disciple, John (CD 2, track 7). Bostridge can be urgent too if the text demands it, as he often is in the scene of Christ’s judgement by Pilate. He deploys a formidable range of vocal colouring and takes immense care over the words. The text is delivered with great clarity throughout. He also sings the first tenor aria, ‘Ach, mein Sinn’. He’s vivid in this highly demanding aria and I’m mildly surprised that he doesn’t then go on to sing the other tenor arias. The other soloists are heard in arias only. Nicholas Mulroy does the taxing aria, ‘Erwäge’ very well though I think the music would have suited Bostridge’s vocal timbre even better. The soprano has two of the finest arias in the work and Carolyn Sampson excels in both. In ‘Ich folge dir gleichfalls’ she treats us to eager singing. Her tone is beguiling and light and this is an absolutely delightful performance. At the other end of the emotional spectrum lies ‘Zerflieβe, mein Herze’. Here the tone is ravishing, the line tenderly spun and Miss Sampson’s exquisite performance brings out all the sorrow in the music in just the right way.